The 49th annual Midwest League All-Star Game will be played at Fifth Third Field in Dayton on June 18, 2013, but the festivities for the 2013 All-Star Game will get underway a night earlier, on Monday, June 17. 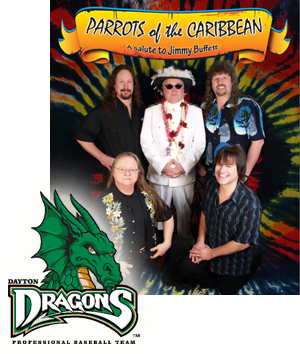 The Dragons will host an All-Star Block Party at the Fraze Pavilion in Kettering, featuring the #1 Jimmy Buffet tribute band in the county, The Parrots of the Caribbean. The party gets underway at 5:30 PM. The Green Team and Dragons Mascots Heater and Gem will provide entertainment and the Midwest League All-Stars will take part in an autograph session. There will also be inflatable games at the Fraze for fans of all ages. The Parrots of the Caribbean take the stage to perform at 7:30. The Parrots of the Caribbean are known internationally as the top Jimmy Buffett Tribute Act around, delighting audiences throughout the U.S. & Canada for more than a decade. In April 2012, the act had the honor of performing for our troops in Okinawa, Japan. This high-energy, original stage show puts the ROCK in ‘Trop-Rock’, as they feature a “Salute to Jimmy Buffett.” These seasoned professionals provide quality musicianship, as they perform outstanding renditions of Buffett’s Biggest Songs. Tickets for the Dragons All-Star Block Party go on-sale Saturday, May 11 and cost just $10. Purchase tickets online, go to www.fraze.com/dragons. Tickets can also be ordered by phone at (800) 514-3849 or in person at the Fraze FanFare, located inside the atrium of the Town & Country Shopping Center located on the corner of Stroop and Far Hills Avenue in Kettering.